February 1st marked the official grand opening of Maude, celebrity chef Curtis Stone's long-awaited "dream little restaurant" named after his grandmother. We'd heard rumors of an eatery since late 2010, but it was finally confirmed last year when he took over the old Pici Enoteca space on Beverly. I'm glad that Stone's forgoing something big, glitzy, and horrible (à la Guy Fieri), instead opening up a place that's right up my alley: small, seasonal, and tasting menu-focused. About the Chef: An Australian native, Stone was born in 1975 to a family that loved cooking, and started in the kitchen with his mom and grandmum at age four. He attended the Penleigh and Essendon Grammar School, then went to study business before leaving to pursue a career in the culinary field. Stone's first real job in the biz, at age 18, was an apprenticeship at the Savoy Hotel in his hometown of Melbourne. Following, he ate his way around Europe before arriving in London to seek employment with the legendary Marco Pierre White, whose autobiographical cookbook White Heat was the first he'd ever read. 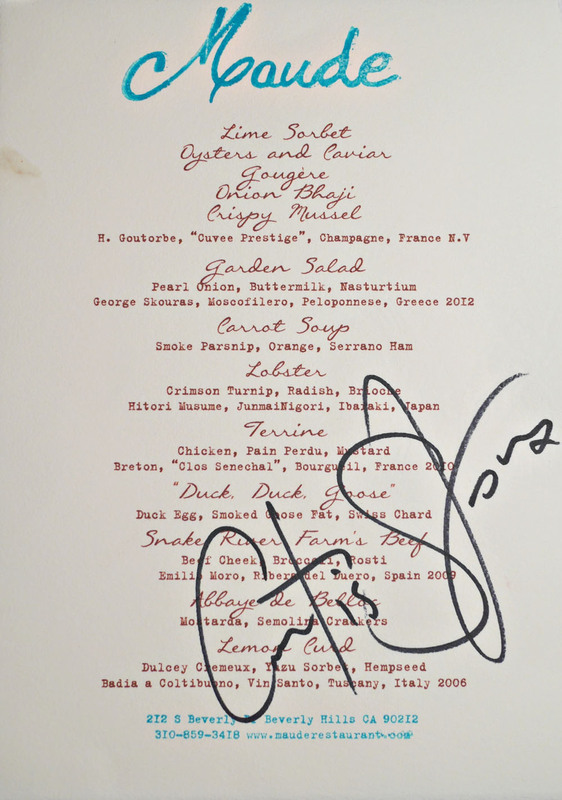 At age 22, Stone realized his dream and began cooking under White at The Grill Room at the Café Royal Hotel. A year later, in 1998, he moved to White's newly-opened Mirabelle, starting as a chef de partie before being promoted to Sous after six months. After helping the restaurant secure a Michelin star, he transitioned to White's Italian-influenced Quo Vadis, where he spent four years as head chef and helped earn the spot a star from Michelin. 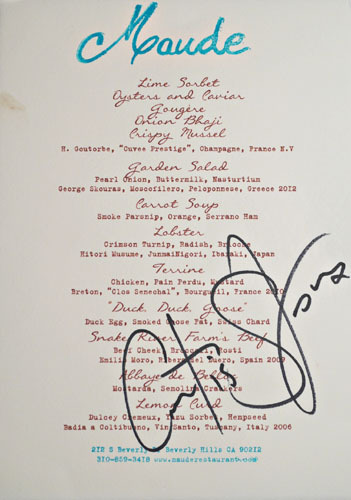 While Stone was working at Quo Vadis, he was approached by a publisher who wanted him to appear in the book London on a Plate, written about the City's best chefs. Once the volume was released, he received a call from Jamie Oliver's agent and began doing television work in Britain, appearing on Taste Today, Good Food Live, Saturday Kitchen, This Morning, and even filming a 15-episode series called Dinner in a Box in 2002. The next year, Stone returned home to Australia to film traveling cooking show Surfing the Menu with fellow chef Ben O'Donoghue. In 2004, he hosted the reality show My Restaurant Rules, then moved back to London to help relaunch Bluebird in Chelsea with Sir Terence Conran. Stone relocated to the US in 2006, finding work on TLC's Take Home Chef, which introduced him to American audiences. This led to further TV appearances, including on shows such as Today and Martha. In 2010, he competed on Season 8 of Iron Chef America, losing to Bobby Flay in Battle Skipjack Tuna. This was followed up by a stint on Season 9 of The Apprentice, where he finished in fourth place, and then a role on NBC's America's Next Great Restaurant in 2011. Stone's next gig brought him to Bravo, where he famously replaced Kelly Choi on Top Chef Masters, and in 2012, the network made him co-host of Around the World in 80 Plates, along with Cat Cora. His latest score came late last year, when it was announced that he'd be guest-hosting The Chew on ABC. In between all these various projects, Stone's also been able to release three cookbooks: Relaxed Cooking with Curtis Stone in 2009, Cooking with Curtis in 2010, and What's for Dinner? in 2013. Despite all this mainstream success, Stone never had his own restaurant, so that's where Maude comes in, serving as a sort of passion project for the Chef. Inklings of the spot first appear back in 2010, when Steven Fretz left XIV and joined Stone's organization. The two were reportedly working on a restaurant together, but the idea ultimately went nowhere. 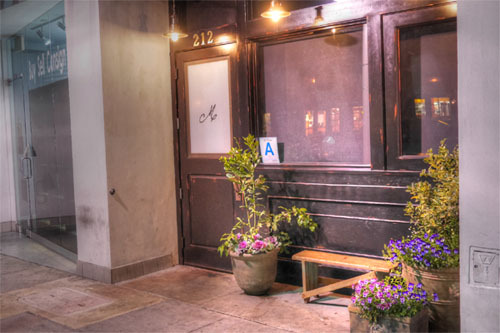 Fretz, of course, landed at The Church Key, while Stone ended up purchasing Pici Enoteca (which used to be Bossa Nova's Beverly Hills outpost) in early 2013. He reworked the space and a hired pedigreed team--proudly advertised as hailing from Alinea, El Bulli, French Laundry, Joël Robuchon, Torrisi Italian Specialties, and Vue de Monde--before debuting Maude (in soft-opening mode) in January this year. 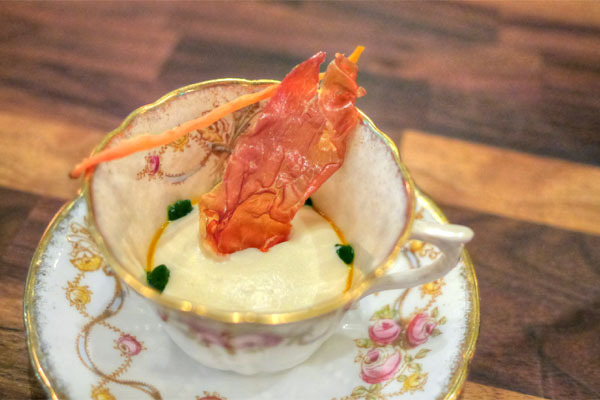 The only dining option at Maude is a nine-course tasting menu, which features a monthly-changing ingredient that's featured in some form or another in every course ("citrus" for February). The price is set at a very reasonable $75 (with some wiggle room depending on ingredient), and wine pairings tack on another $55. Also to drink, you'll find a pretty good selection of beers, ciders, wines, and sakes chosen by GM/Wine Director Ben Aviram (Elizabeth, Alinea, The French Laundry), and corkage is set at $30 a bottle (limit one per person). Click for a larger version. 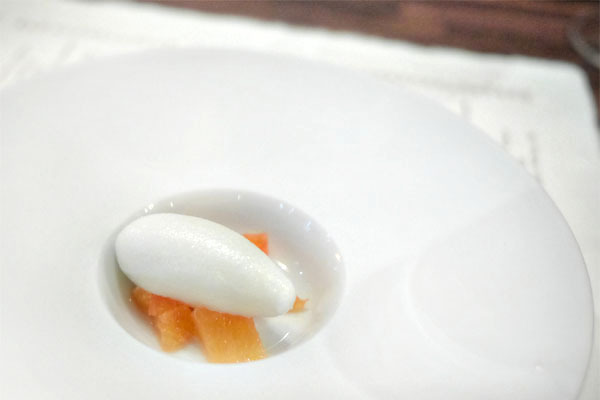 A meal at Maude begins with a series of snacks, the first of which brought together lime sorbet and Cara Cara segments. It was a super light, refreshing sort of dish meant to awaken the palate, the initial sourness of lime leading to sweeter notes from the orange. 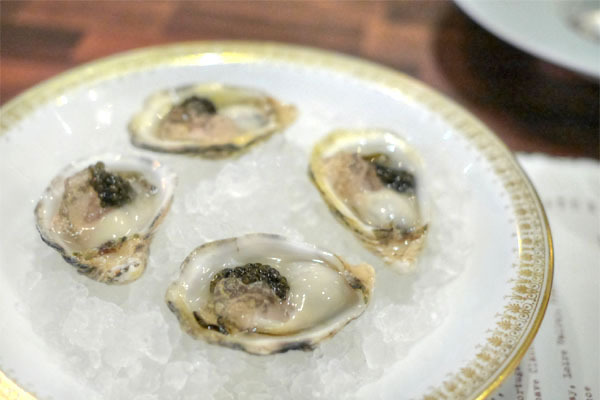 It doesn't get much more classic than oysters and caviar, but Stone mixed things up here with the inclusion of what I believe was a cava-citrus gelée. Think tangy and sweet, intermingled with a focused, forceful salinity, going back and forth on the tongue. A great match to the paired Champagne, which I found delightfully toasty and uncommonly rich, with a particularly intriguing fruitiness to it. 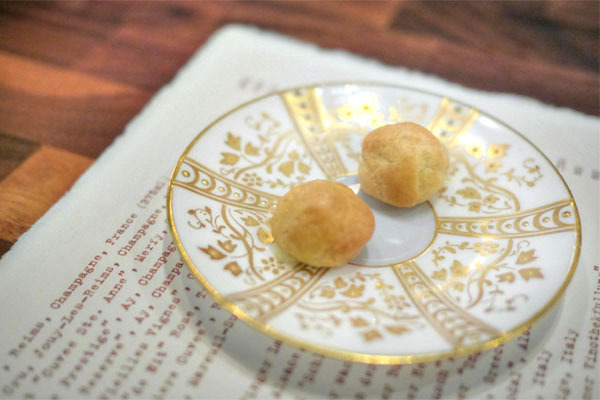 Next up were what must be the tiniest gougères ever. Cuteness aside, they showed off the cheesy goodness that you'd expect, but one joined by almost ethereal notes of artichoke. 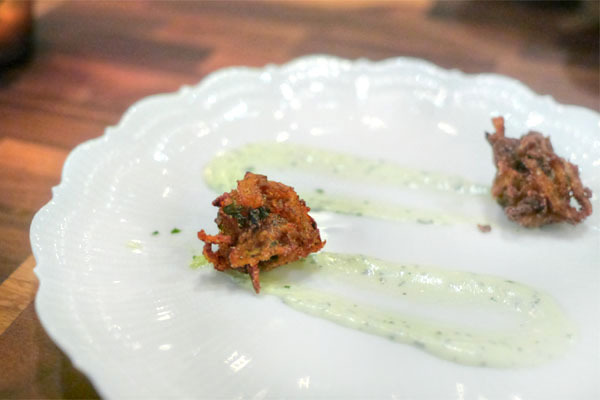 Here was Stone's take on the traditional Indian snack of onion bhaji. They conveyed traditional South Asian flavors along with a sort of lingering bitterness, the cilantro-mint-lime crème fraîche brightening up the experience. 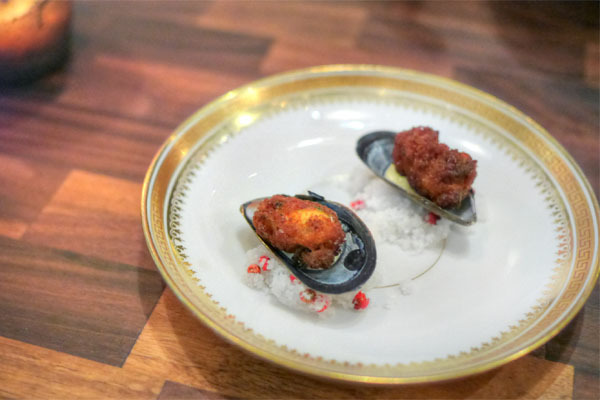 The final of the fivesome gave us crispy mussels with blood orange aioli, a spot on rendition of the fritter that had a delectable savoriness to it that was smartly paired with creeping notes of the citrus toward the back end. 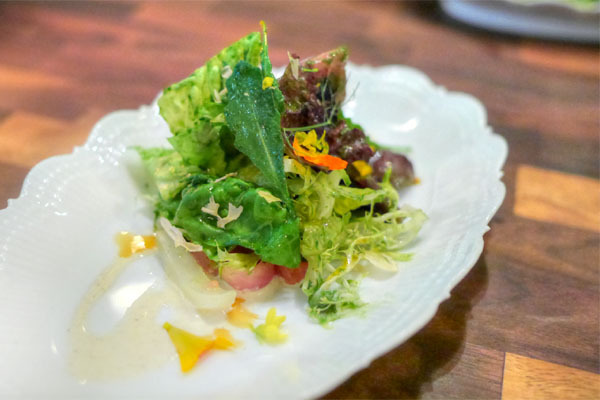 Our first proper course was Stone's interpretation of the ubiquitous chef's salad, comprised of winter greens, oro blanco, and pickled onion, then dressed with caraway-buttermilk. I liked the bitter base to the dish, as well as the bevy of textures going on, but the crux was that dressing, which had a creaminess to it that tied everything together, but also, critically, a hint of anise-y flavor that really differentiated the dish. You have to have a soup with your salad, and the one here was of the carrot-orange variety, featuring smoked parsnip cream, a jamón serrano chip, and parsley purée. I usually abhor carrot soups, but this one truly hit the mark: a hearty, comforting potage with a great depth of flavor, laced with a subtle undercurrent of sweetness, the ham adding a welcomed jolt of salt and crunch to the fray. Superb with the paired wine and its interplay between floral/fruity and saline flavors. 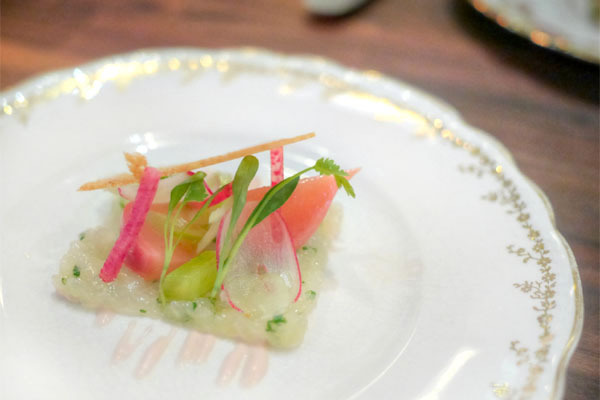 A standout for me was the crudo, which combined spiny lobster with crimson turnip cream, watermelon radish, lemon, fennel, and a brioche tuile. The crustacean itself was slick and snappy, displaying just a modicum of sweetness that paired swimmingly against the bitter crunch of the root veggies, all while the herb-y accents present heightened the dish even further. 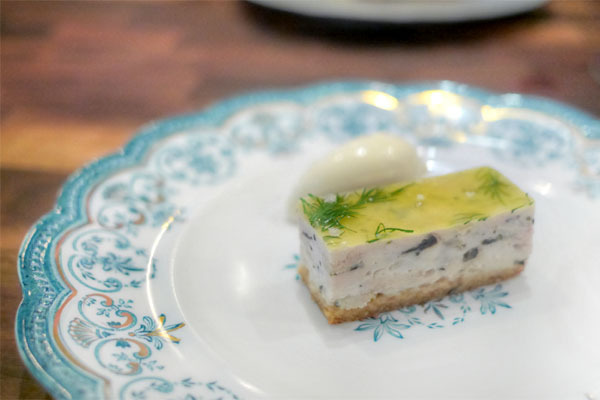 I was a fan of the terrine as well, a layered presentation of pain perdu, chicken, mushroom, tangerine gel, and dill, all accompanied by a Dijon ice cream. I loved the deep, soulful flavors here, and how they played off of the nuances of bittersweet citrus and herbaceous dill, the mustard acting as an appropriately piquant counterpoint to the mash-up. 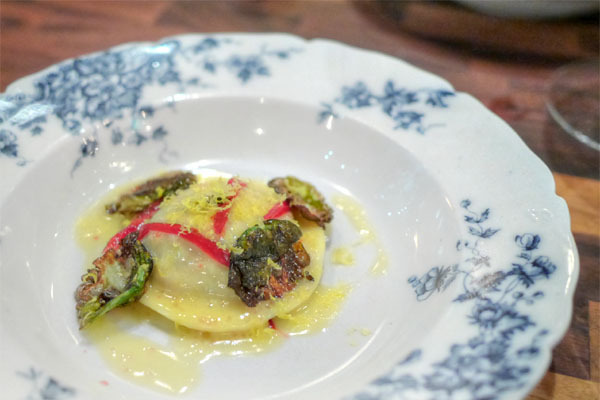 The whimsically-named ravioli was a crowd pleaser, an amalgam of duck mousse, Swiss chard, smoked goose fat, grated dehydrated salted duck yolk, beurre blanc, and Brussels sprouts. I was quite enamored with the deep, lush flavors of the birds here, a succulent, almost buttery sensation that was tempered just enough by the greenery, with a peek of citrus showing through toward the close. 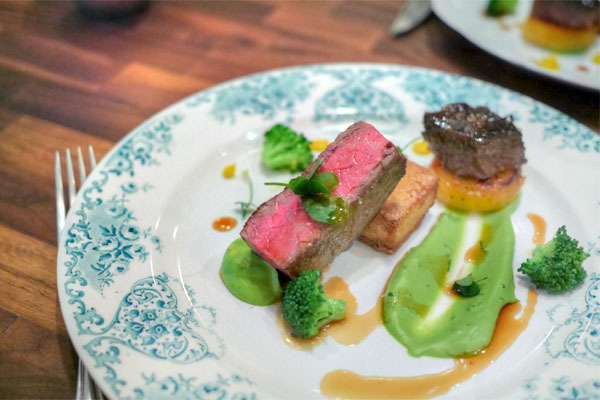 Our final savory brought us American-style wagyu rib eye from Snake River Farms, paired with broccoli and broccoli purée, wood sorrel, potato rösti, and a cube of braised cheek atop a disk of rutabaga. I wish that the steak were a touch more succulent, but I had no qualms with its taste, which worked wonderfully alongside the citrus-y and broccoli notes in the dish. The cheek, meanwhile, was even more luxurious, as dark and tender and gelatinous and deep as you'd want, a great counterpoint to the comparatively subdued flavors of the rutabaga. Perhaps my favorite thing here, though, was the potato, a super savory, satisfying preparation of the ingredient that was amplified by the intoxicating aromatics of what I believe was rosemary. There's no room for a proper cheese cart at Maude, so fromage was represented by a lone block of Abbaye de Belloc, shaved tableside. 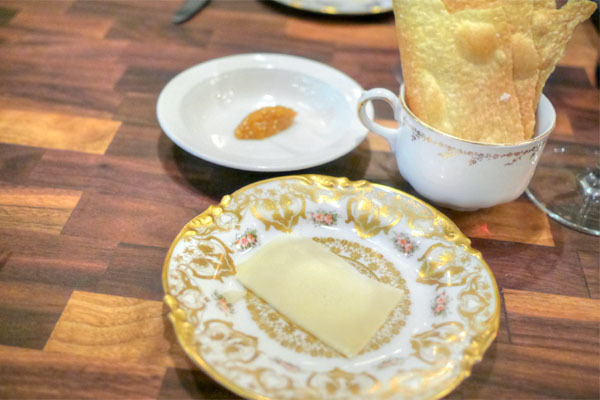 The sheep's milk varietal was to my liking, a semi-hard, creamy sort of cheese that ate well with the citrus mostarda and the crackers in particular (which had a savoriness to them that I swear recalled La Choy Crispy Noodles). 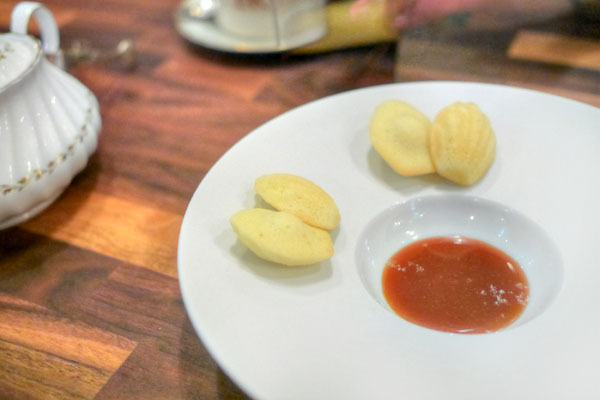 At this point, Pastry Chef Vanessa brought out a pre-dessert of orange blossom madeleines. They were rather fetching, with a wondrously lingering floral quality to them that combined exquisitely with the hefty salted caramel. Dessert proper comprised lemon curd, Dulcey cremeux, shortbread, and a crème fraîche-yuzu sorbet. I found the dish very well integrated, with homey, yet elevated flavors that balanced sweet and sour with a buttery, subtly savory flair. A lovely complement to the paired dessert wine. 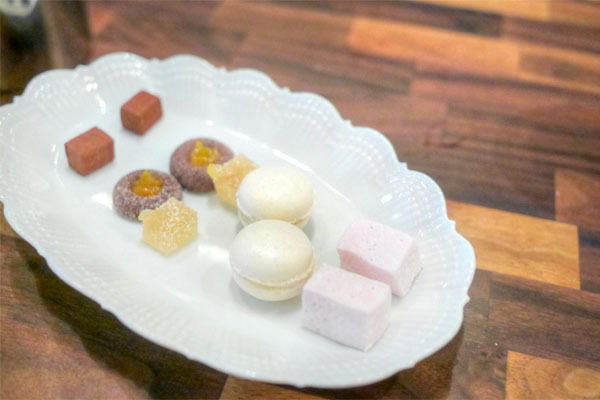 Mignardises arrived in sets of five. Going right to left, we have: light, airy blood orange marshmallows; Limoncello macarons that conveyed a taste reminiscent of lemon Starbursts(! ); super aromatic Buddha's hand pâtes de fruits; chocolate-kumquat thumbprints; and satsuma-chocolate truffles, which showed off that classic chocolate-orange interplay. 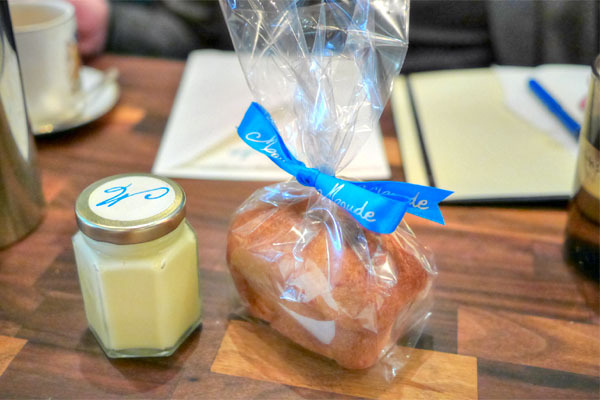 Take home gifts included lemon butter and a mini loaf of brioche, both of which I enjoyed for lunch the following day. I'm happy to report that I was decidedly satisfied with my meal at Maude. I think there are quite a few people that'll be surprised with the place, since, around these parts, Stone is known for more for his camera-friendly looks and extensive television work than his cooking. People don't realize his background, the fact that he ran a Michelin-starred place for Marco back in the day, and so with this restaurant, he's showing us that he's more than just a pretty face and can actually run a kitchen (and yes, he was actually in the kitchen most of the night, not just working the dining room). The cooking's on point, and I'm a fan of the concept, of featuring a key ingredient that must be weaved throughout the menu, sometimes as the hero in the dish, but other times in a supporting, or even barely discernable role. Maude's likely the most interesting, ambitious new restaurant to grace Beverly Hills in a while, and is the type of place that I sorta want to revisit periodically, just to see what they do with each month's secret ingredient. I suspect that many others might want to do the same after eating here. The dinner looks really delicious and lovely. Particularly for the very reasonable price of $75. I wonder how they can make money at this price level in Beverly Hills, with talented chefs and quality ingredients? I will definitely be making a visit here as this seems to be my kind of place, with the focus on good flavor combinations and substance rather than gratuitously avant-garde. The plates look beautiful, but not overly fussy, and no over the top and in my opinion, unnecessary molecular techniques. Excellent post, as always. 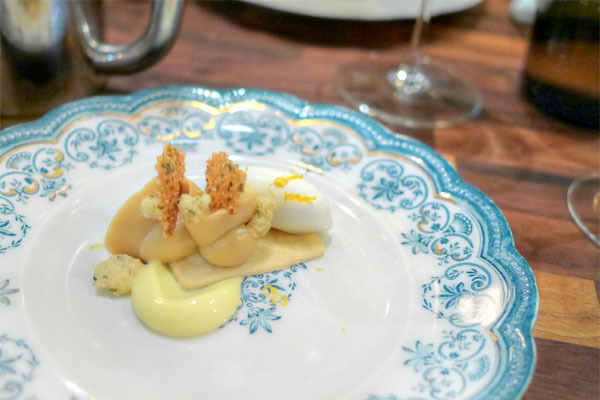 I have never really liked long tasting menus; too often they become a train-wreck of competing flavors, all fiddled with by whose hand beyond endurance. But here is a thought-through menu, every course of which looked good on those granny-plates. Real food. On my list. Thanks, Kevin. On my list for sure. There are too few places innovating in a more formal context. So much stuff is now Playground style fun small plates (which I also like), but sometimes a little more sequencing is less chaotic. would you go as far as saying that,if michellin were to return to LA it would get a star? QUO VADIS NEVER HAD 3 MICHELIN STARS. IT WAS THE RESTAURANT AT THE HYDE PARK HOTEL THAT GAINED 3 MICHELIN STARS UNDER MARCO AND CURTIS NEVER HEADED UP THE KITCHEN THERE. Dianne: My guess is that they're not making that much money. Stone I'm sure is already quite wealthy, so I imagine that this is more of a passion project for him, a chance to get back in the kitchen and do some real cooking. Anon: I still enjoy longer tasting menus though. A well crafted one can have a variety of flavors, yet still be cohesive as a whole, depending on the Chef. Andy: Can't say I disagree with that. Josh: I think that's a reasonably safe assumption. Anon: After digging into Quo Vadis a bit more, it looks like it had at least one Michelin star. I saw a mention of two as well, and the three was from Stone's own web site. I've updated the post accordingly to conservatively state just one. Hi Kevin, the 3 rosettes he mentions on his web site are awarded by the AA guide in the UK. Looks like a great addition, good change from the overdose of small plate joints!